We all have a selection of different knives from the robust Stanley that is great for cutting tough material such as carpet to the small model making knives with blades that have never been changed their whole life. One knife that is a must is the scalpel and so I thought it would be useful to look at the best of these, the Swann-Morton’s. I bought a No. 3 handle as shown below and a pack of blades that are shown just below that. The blades come in various sizes. 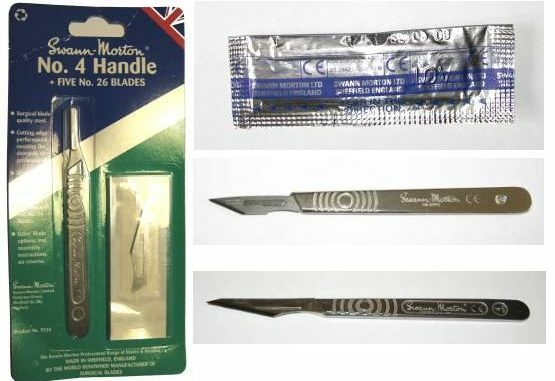 This particular pack contains five straight pointed blades and they are great value at just 59 pence. The assembled blade. It does take some care to assemble the handle and blade. This has to be the most useful craft knife you will own as it will cut anything (and I mean anything – be careful of fingers) and is fine so you can use it on the most delicate of pieces. I think the No. 3 size handle really is the most versatile as the blade is a good size to work on the smallest of models, but at the same time quite happy stripping down paper, card, balsa and thin wood. Price: approx £3.00 for the handle and approx £0.60 for a set of five blades. They do need to be treated with care as they are extremely sharp, even fitting a new blade needs to be done carefully so as not to slice your fingers. If you break a blade I find the best thing is to wrap the broken parts up in masking tape before throwing away. The handle is very well made and sits very well in the hand. The blade is held in place securely and there are no worrys that it will come free whilst in use. As I mentioned above the blades are very very sharp. There are many different blade shapes and different handle sizes. The Swann-Morton website has lots of information on using the knife with pages on fitting and removing blades: www.swann-morton.com. If you are into model making then you have to have a scalpel. There is only one scalpel and that is one made by Swann-Morton. The No. 3 size is the most versatile and the first one to acquire. Just buy one and keep it for life.